Looking for another new year prediction? How about this - Facebook Connect is going to be big in 2009. Whether you're a publisher or the end user, Facebook Connect is dead-simple. 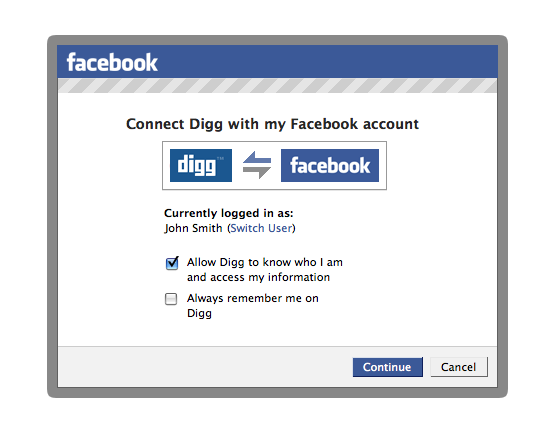 As a publisher, blogger or any website manager, implementing Facebook Connect can be as simple as a basic plugin installation. But more importantly for the end user, Connect lets them login to a website using their Facebook credentials and avoid creating yet another account. Now, here is where things get interesting. By pulling demographic information you have already provided in your Facebook profile such as location or age, any site can be personalized according to that information. As noted in Mashable, the startup Workstir autotmatically serves up local job opportunities without the need of creating another profile. Or consider the increased personalization that could come from a tight integration with iTunes or Amazon as suggested by others. By tightly integrating a website with your social network within Facebook, any website can have a social element. Aside from seeing who else is on the website, it's easier than ever to share items with your network. Just purchased the new Eric Hutchinson album (which you really should)? Sharing that information with your trusted network is easier than ever. By using Facebook Connect, that purchase is simply added to your Facebook news feed and shared with your friends. We already know that social network users are three times more likely to trust their peers' opinions over advertising when making purchasing decisions. So why not bake that social network influence into your web product or service? By making their products or content easily sharable within your network, brands can better connect with their biggest fans. Through Facebook Connect, any web application could look at your number of friends, interests and activity to determine your level of influence within the network and serve up relevant information or offers based on your role within the community. And finally, anonymity has been a challenge for online communities since the beginning of the interwebs. But using a social graph identity like Facebook Connect (or from Google or MySpace for that matter) puts real people behind those actions online, and not relegated to the unknown creepiness of user "jdawg4eva." Connecting with real people who are more accountable for their comments and actions will build trust. Sure, there are other portable social graph options - Google Friend Connect, MySpace, OpenID - all will play a role in shaping the web in 2009. But right out of the gates, Facebook has the community to make Connect an immediate value-add for both digital marketers and users to create a more social web.